Please Scroll Down the Screen Past the SKY Tower Description and Photo Gallery to Find Sky Las Vegas Luxury Condo and Penthouse MLS listings for Sale. SKY is located at 2700 Las Vegas Blvd. South, 89109 – Directly on “The Strip!” It is a guard gated building that is home to some of the most spectacular bi level penthouses in the city. Each is over 5000 sq. ft. and feature a spacious rooftop deck with an outdoor spa, and private interior elevators. These are located on floors 43 & 44. On floor 42, you will find 4 single level penthouses, each about 3000+ square feet. There are 2 HOA’s, The Sky Las Vegas Master HOA and The SKY LAS VEGAS HOA. Combined, the Sky HOA dues will equal upwards of 60 cents psf/month. 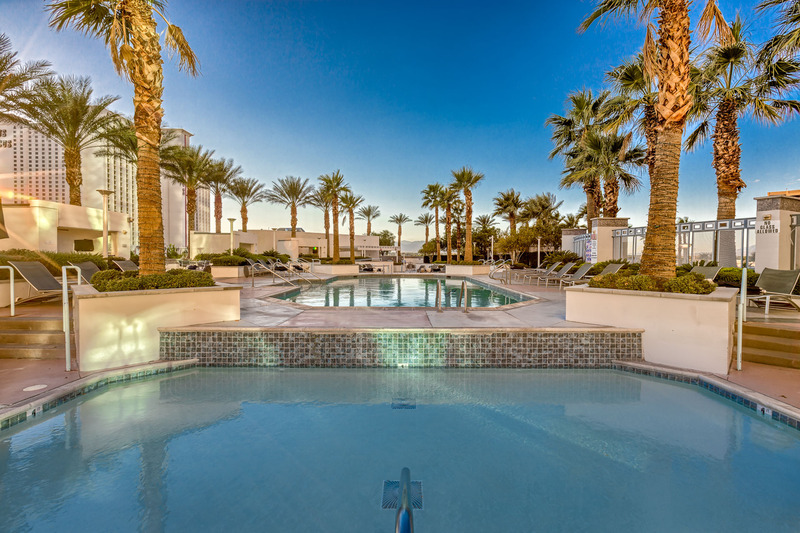 Amenities are plentiful: gorgeous pool area with cabanas that have flat screen TVS in them, indoor spa, outdoor spa, putting green, pet area, valet, concierge, gym, racquetball courts, business center, and more. SKY Las Vegas is investor friendly. It has one of the most liberal rental policies of any Las Vegas residential high rise condominium, permitting 3 month minimum rentals. One Las Vegas is the only other residential condominium that permits rentals as short as 3 months, but there is a stipulation at “The One”, whereby 3 month rentals are permitted if the condo is furnished and 6 month minimum if the condo is unfurnished. That said, all leases at SKY are subject to HOA approval, while leases at ‘The One”, can just be filed with the HOA without an approval process. If you would like a set of SKY Las Vegas floorpans, please reach out to us. We were the only Las Vegas real estate agents permitted to sell SKY LAS VEGAS at its pre-launch party back in 2004. And for quite awhile after that. Our Team has SOLD tens of millions of dollars of condos in SKY. We know our high rise stacks, floor plates and view corridors, unit sales history, HOA details, rental restrictions, Board review process for leases, and rental rates like the backs of our hands. Contact The Stark Team to get started in your Sky Las Vegas condo search. Looking to Live Right On the Las Vegas Strip? CityCenter Condos are Smack Dab in the Heart of The Strip and surround the Aria Hotel and the Crystals Shopping Center.